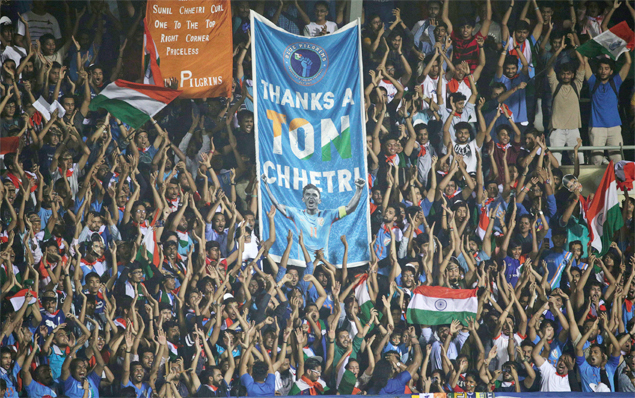 MUMBAI: Bhaichung Bhutia and IM Vijayan were there, the fans too were there, and the magnet that drew them all into the Mumbai Football Arena for India’s Intercontinental Cup game against Kenya was Sunil Chhetri. Captain Chhetri got, deservingly so, the audience he sought after his impassioned plea struck a chord with fans, who turned up in droves for India’s second game. Chhetri, playing in his 100th international game, was felicitated by former skippers Bhutia and Vijayan. He was also given a guard of honour by his team-mates as his wife and parents watched from the stands. “I never thought this would become so big. When you are representing the national team, you deserve an audience,” Chhetri said before the start of the game. Long queues of fans were seen in front of the stadium for tickets to watch the game and the crowd started trickling in from early evening. The 33-year-old Chhetri made an emotional appeal to football lovers to come and support the Indian team, which is using this tournament as preparation for the 2019 Asian Cup. The video was uploaded a day after he slammed a hat-trick in India’s 5-0 demolition of Chinese Taipei in the tournament opener, and he found instant support from the country’s top cricketers, including current captain Virat Kohli and the legendary Sachin Tendulkar. After a lukewarm response, people finally turned up to cheer the Men in Blue. Chhetri had uploaded a video on Saturday and urged the fans to support the team. Mumbaikars responded by thronging the Mumbai Football Arena in suburban Andheri despite it being a Monday evening. Chhetri is the country’s leading scorer with 59 goals from 99 international caps, placing him third in the world’s leading scorer’s list. He is the second Indian to appear in 100 international games after former skipper Baichung Bhutia. Anil Kumar said that he was inspired by the video and came to watch the game from Ghaziabad, a township near Delhi. Another fan, Adam Cardoz, said that it was because of Chhetr’s video that he decided to come and watch the game. Adam, with his friends, came all the way from Badlapur in Thane district, which is around 70 kms from the stadium. Nikhil, from Gujarat, said that he has been backing the team since the last four years. Another young fan, Chandranil Mazumdar, remarked that he saw the Chhetri video at least thrice and decided to support the team. When the Indian team bus arrived at the Andheri Sports Complex, fans greeted Chhetri and he waived at them. Meanwhile, a person called Nikunj Lotia has claimed that he has bought the entire General Stand 4, which has about 1000 seats. “Have booked entire STAND NUMBER 4 for all you football fanatics! All you have to do is just be there and cheer! More details on stories! #seeyousoonilchhetri #seeyouall,” Lotia posted on his Twitter handle.